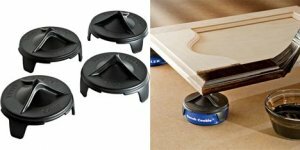 I would have never expected to see accessories for something as simple as the Rockler Bench Cookies, but you can't go wrong when trying to make a product even more useful. The new Cones for Bench Cookie offer painters a way to utilize the non-slip abilities of the Bench Cookie, and apply this to there finishing process. The cones will work with all Bench Cookie models and simply fit snugly over the body of the cookie. What the cone does is further lift your project off of your bench, which allows for greater access to the surfaces. Because the cones come to a small point, they offer minimal surface contact; this in turn, allows users to finish both sides of a project without having to wait for the finish to completely dry. The cones completely cover the tops of the cookies and also cover a bit of the sides, so they will be mostly protected from accidental drips of paint. A pack of four costs $4.99. If you plan on doing any finishing with your Bench Cookies, you might as well pick some of these up.